If you're like me, and love game day snacks as much as sacks, you're not alone. 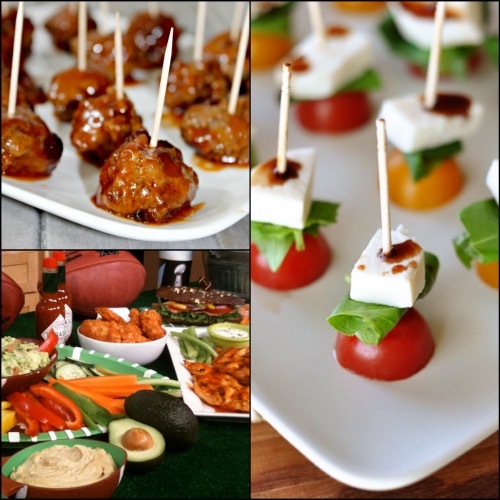 Many sports fans fess up to enjoying football food more than the game. Problem is, typical fan fare like chips and dip, burgers and brats, pizza, wings and beer can easily add up to more than a day's worth of calories and several days' worth of saturated fat -- all before kick-off! Here are some of my favorite lighter football snacks so you don't end up feeling like a 300-pound lineman by the end of the season. To contain calories when there's a "blitz" on chips and dip, I opt for dips with more filling fiber and fewer calories than a typical Ranch or queso dip. Best bets: my Skinny Guacamole recipe, hummus and bean dip. Dip Tip: Replacing a cup of regular sour cream with nonfat Greek yogurt shaves 315 calories and 45 grams of fat from your dip recipes. Appetizers and sides often pile on more calories than main courses, so look for ways to make your apps veggie-packed. To make: Slice cherry tomatoes in half and put on toothpick, add one small slice fresh mozzarella cheese and one basil leaf. Sprinkle with salt and pepper and drizzle with olive oil and balsamic vinegar. Ground skinless turkey breast has one of the highest protein-to-calorie ratios and using it in place of 90-percent lean ground beef saves 80 calories and 9 grams of fat per serving (about four mini meatballs). Upgrade this egg-cellent low-carb savory snack by using fiber-and protein-rich hummus instead of mayo for the filling. To make: Boil six eggs and cut in half and to the yolks add half cup hummus, 1 tablespoon extra virgin olive oil, salt and pepper and puree in food processor. Using a piping bag, fill each egg white half with about 2 teaspoon of the yolk mixture and sprinkle with paprika. The snack food aisle is packed with so-called "veggie" and "bean" chips, but unfortunately, most are nothing more than potato or corn chips sprayed with worthless veggie powders. Real veggie chips are easy to make. All you need are vegies like sweet potatoes, kale or beets and you can make your own. If that's too much work, buy real veggie chips that have only a few ingredients and a vegetable or bean is the first ingredient. Best bets: Beanitos is a great stand-in for tortilla chips and Snapea Crisps provide are light but have a powerful crunch! Use apple rounds instead of bread to create these mini chicken salad rounds. Core and slice several of your favorite crisp apples into quarter-inch thick rounds. Then top each apple round with your favorite chicken salad and sprinkle each round with chopped pecans. According to the USDA Nutrient Database, three cups of air-popped popcorn has about 100 calories and 3.5 grams of fill-you-up fiber. In fact, a study published in Nutrition Journal reported that adults reported feeling less hungry after eating 100 calories worth of air-popped popcorn versus 150 calories worth of potato chips. The fiber and larger serving size of popcorn is though to enhance feelings of fullness. Nuts provide a stress-relieving crunch when anxiety levels rise. Instead of snacking on shelled nuts (too easy to overeat), opt for in-shell nuts instead. Plus, shelling nuts is a good way to help calm your nerves!